A bizarre anomaly of around 250 km has been found in Antarctica thanks to satellite images provided by NASA. A bizarre, new theory claims that a mysterious anomaly discovered beneath the ice in Antarctica may be a sort of secret base. UFO hunters are convinced that not only did the Nazi’s built secret bases on the north and south pole but that there are several bases on Antarctica that were used not only by humans but by otherworldly visitors as well. 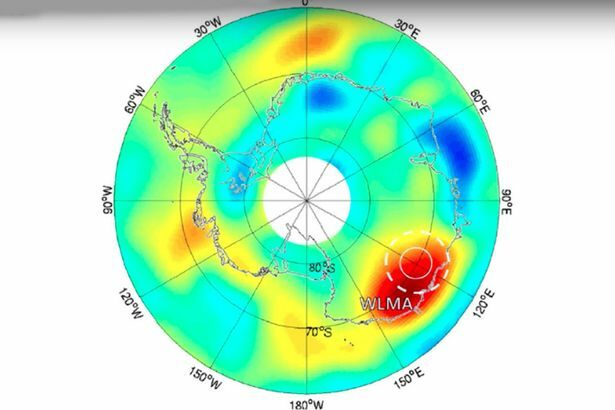 The massive Antarctica anomaly encompasses a distance of nearly 250 kilometers across and reaches a maximum depth of 850 meters below the surface. The anomaly was discovered in an area known as Wilkes Land on Antarctica. You only need one such discovery, and a conspiracy is at hand. Furthermore, it is believed that the US Navy led a mission to investigate such anomaly. The odd anomaly was first found by NASA satellites in 2006. However, not everyone is willing to go with the conspiracy theory of secret bases located hundreds of meters below the Antarctican ice. Others believe that the bizarre anomaly isn’t so bizarre after all, and that it is in fact the result of an asteroid impact twice the size of the one which exterminated the dinosaurs.